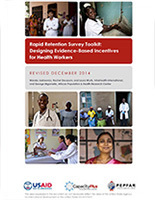 The Rapid Retention Survey Toolkit is designed to help countries determine what would motivate health workers to accept and remain in rural posts. It builds on the World Health Organization global policy recommendations for rural retention and is based on the discrete choice experiment (DCE), a powerful research method that identifies the trade-offs professionals are willing to make between specific job characteristics and determines their preferences for various incentive packages, including the probability of accepting a post in a rural facility. Employing a simplified version of the DCE methodology, the toolkit guides HR managers through the survey process to quickly assess health students’ and health workers’ motivational preferences to accept a position and continue working in underserved facilities. The results can be used to create evidence-based incentive packages that are appropriate within a country’s health labor market. The toolkit includes step-by-step instructions, sample formats, and examples that can easily be adapted to a specific country context, including survey planning, design, instrument development, and administration as well as data analysis and presentation of results to stakeholders.